The other week, I was at my brother’s house for dinner. As he was cooking, I noticed his copy of Weber’s Way to Grill that I got him for his birthday last year. It looked like it hadn’t even been opened! So I started paging through it, seeing if anything would catch my eye and decided to borrow it from him. Don’t worry, Michael, I’m almost done with it. You can have it back next time I see you. 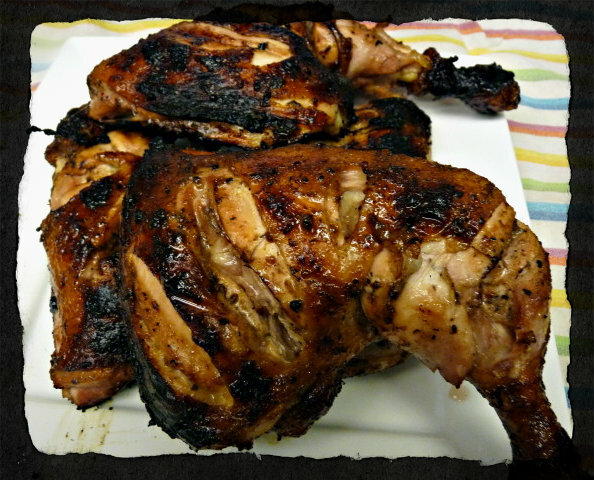 One thing that really piqued my interest was the recipe for Provencal Marinated Chicken Legs. OK….really the recipe did not interest me that much, but rather their illustrations of how to prep whole chicken legs. 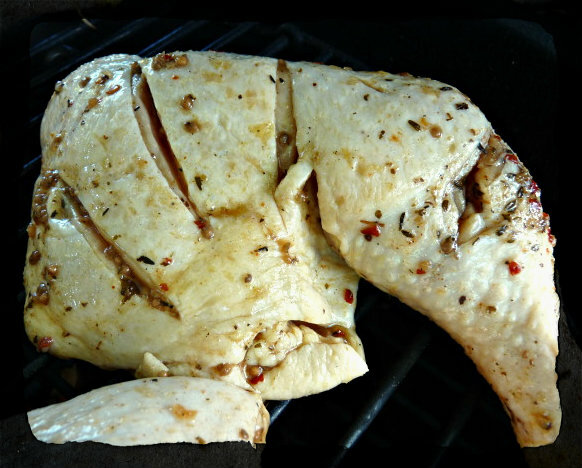 Cutting an opening between the drumstick and the thigh to expose that innermost meat and speed up the cooking time. I’d never heard of that before. And making slashes on the outside of the leg and thigh to allow the marinade to penetrate deeper? New to me as well, but it made sense. And with leg quarters running (no pun intended) about $0.99 a lb here, I felt this was something I could experiment with and not feel bad it if didn’t work out. 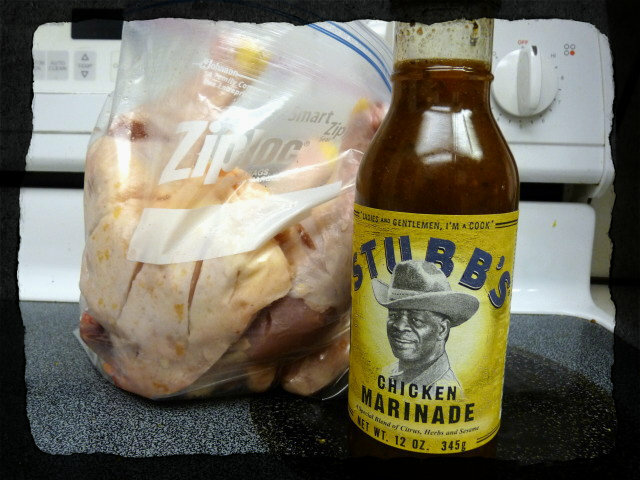 Digging around the pantry, I found this chicken marinade from Stubb’s. I don’t remember when I picked this up, but it sounded like a plan to me. The chicken got “slashed” yesterday morning and went into a Zip-lock bag around 6:00am right before I headed out the door to work. Yeah, I know, I get up way too early for work. I figured it would get about an 11 hour marinade, although the bottle says 2-6 hours. I set up the Egg for a direct cook at 375F, using my Grill Extender to raise the cooking height further up and away from the coals to prevent it from burning (this is how I do most of my cooks with chicken). 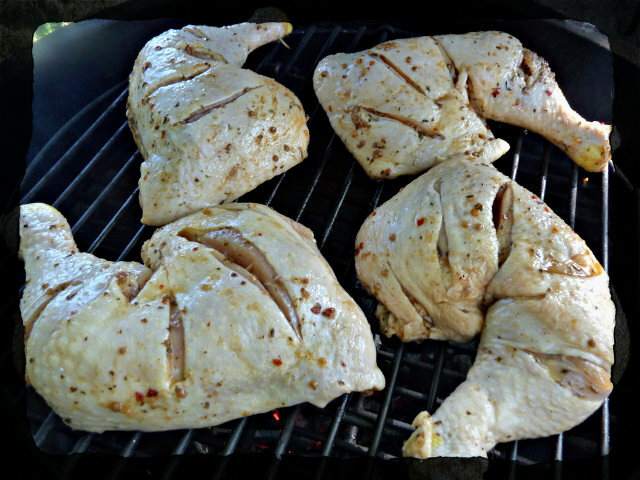 If you are using another type of grill, I would suggest cooking the chicken indirect or having two zones where you can move the chicken away from your heat source if it begins to have flare ups from the drippings. 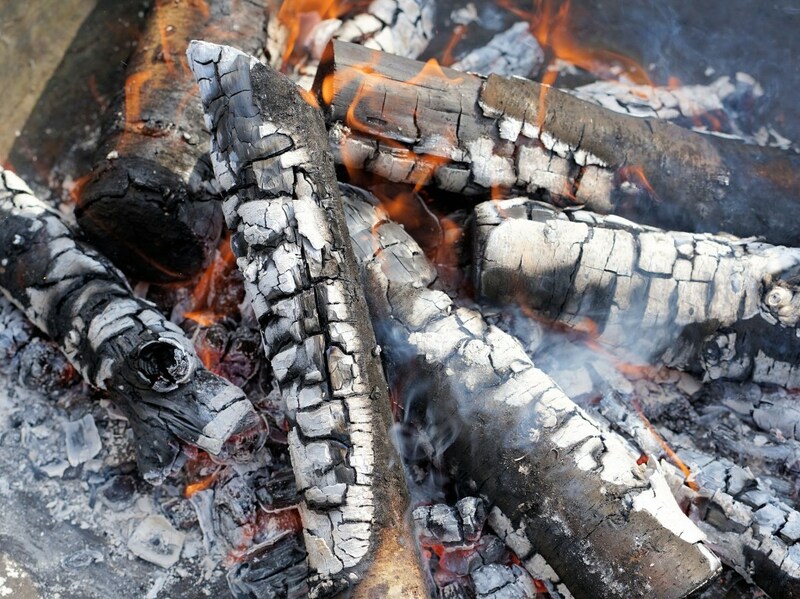 For smoke, I went with apple wood chips as I think it offers a more delicate flavor than some of the other woods like mesquite or hickory that can easily over power chicken. Close up view of the slashes I made. Looks like Wolverine or Freddy got hold of my chicken. 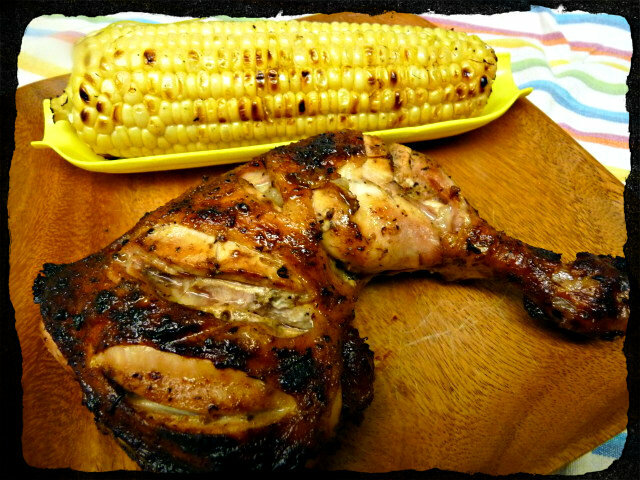 The marinade from the chicken was reserved and used to marinade the chicken throughout the cook. I know some people feel a little uneasy and squeamish about that, but I boiled the marinade for 5 minutes before using. Food borne bacteria die at or below 165 and a boil is way hotter than that, so I feel like it is a safe practice. And I haven’t gotten sick or died from it yet. The chicken took around 45 minutes to cook and was pulled around 170. Seeing as how my spatchcock chickens generally take about an hour to cook, I figured the slashes might have sped up the cooking process by about 15 minutes. Not really enough to consider a big difference. The chicken came out pretty good. It was moist and flavorful. Maybe the slashes didn’t speed up the cooking much, but they really did make a difference with the marinade. Which makes sense. The more surface area exposed, the more flavor you are going to get with each bite. The marinade itself, it wasn’t mind blowing or stellar. It was average in my book. It did give the chicken a hint of sweetness, but I really wasn’t picking up on the citrus it claimed. Now that I’m looking at the bottle, I think what I couldn’t put my finger on was the sesame it claims. Would I do it again? Maybe, if the price was right. Come to think of it, I think I picked up the marinade because I had a coupon. I guess I’d pick it up again if I had another one. 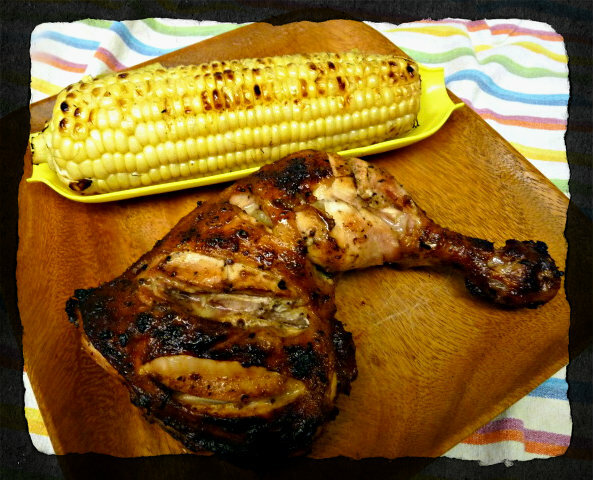 As for the slashes, if you can get past the fact that it looked like Wolverine got ahold of you chicken before it was tossed on the grill, it’s not a bad trick to have up your sleeve. More flavor per bite. But if you are into aesthetics, this might not be the way for you to go. I love that you’re reviewing a process more than a recipe. That’s awesome. I wonder if the same affect could be achieved if you used a skewer and poked holes all the way through the chicken pieces before putting them in the bag of marinade. If you squished it around several times during the day, the marinade would work its way in, especially if there’s any level of salt in it. It would also look less Wolverineish. When you first mentioned the bit about using the reserved marinade, I immediately got concerned, but to boil it to safety first is brilliant. I’ve always hated dumping the stuff down the sink. I guess the other option is to always save a little out from the bag and use it for basting. Thanks Mom Chef. As you know, bbq isn’t just about recipes, the whole process is just as important and there are all kinds of tricks and techniques out there that I try and share when I can. I thought I had never heard of something like this till somebody pointed out that they make slashes in their whole fish…..DUH!! I do that too. I guess the fish to chicken concept didn’t translate in my head. I like your idea of the skewer. Kind of like taking a Jacard to tough meat. I did have Mrs. G turn the chicken and “squish” it around a few times before she went to work a few hours after I left and I did it some more once I got home just trying to get it down in every nook and cranny. That was a good point I left out. Hope you try the method and let me know how it works for you. I do 1/4s routinely – naked. Usually just oil them and add rub. I’ll try cutting them tomorrow. Chicken 1/4s are pricy in your area. Rarely get over .69/lb. here in central Mo. Never had a drying problem with skinless chicken if cooked to the proper temp. I don’t know if that was a normal price for 1/4s, just what I paid for them the other day. Haven’t bought them in a long time. I’ve never had a problem with drying out dark meat chicken (or white for that matter). Like you said, its all about cooking to temp. I picked up that technique up from Steven Raichlen, he does it on spatchcocked birds like the Cambodian chicken. I don’t do it every time but I do it sometimes. Hmmmm….don’t remember ever seeing that one before. Was it in one of his books or his tv show? great looking site. I like the photo style you are using – is that from instagram or something else. I’m always looking to learn from other eggheads. Keep up the great work- your recipes look fantastic! Thanks for looking at it Robyn. I just use Photobucket to edit my pics. Would like to upgrade to some software someday, but haven’t spent much time looking into that. Been following your site for awhile. You are an inspiration.